What Holden Caulfield failed to understand is that the flowers aren’t for the dead, they’re for the living. 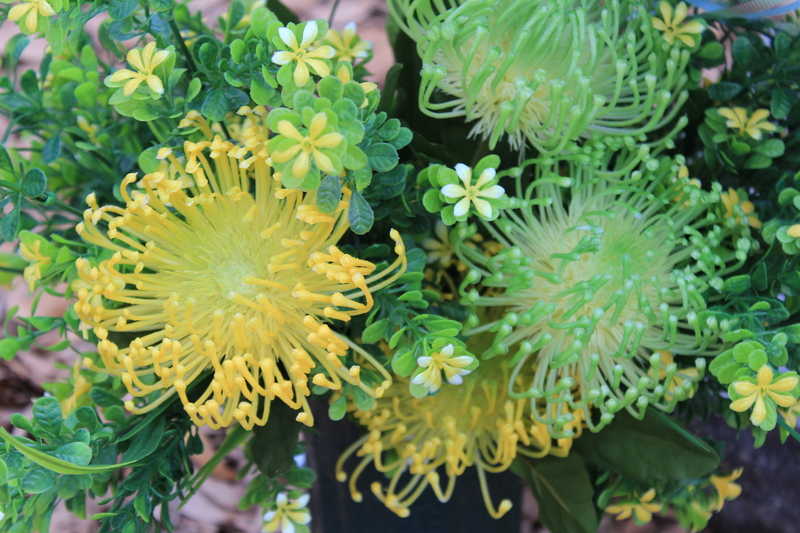 The flowers, the memorial, the dinner after, the condolences posted to the funeral home website, the memories shared on Facebook….these are all for the living. They’re all ways in which those of us left behind find comfort. I first met Sandy & Kevin Clifford in 1982 when Jim was assigned to Wurtsmith Air Force Base in Michigan. Jim was a 1st Lieutenant and Kevin was a Captain. 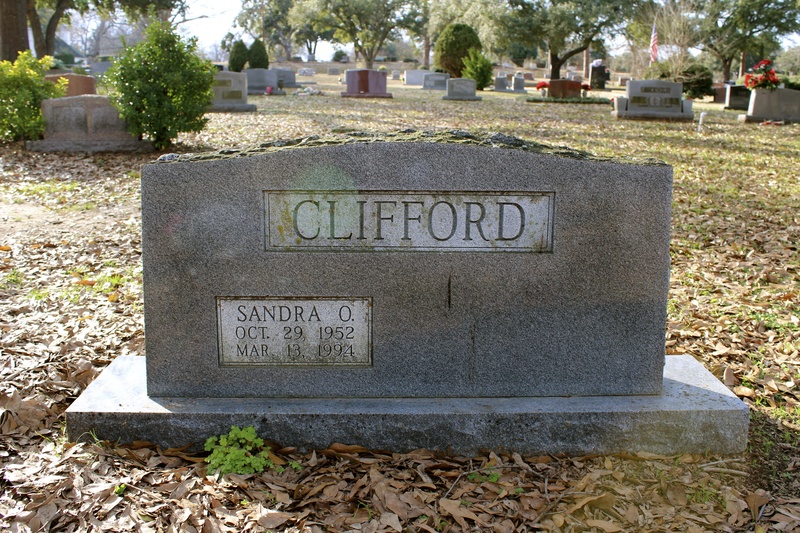 We were relatively new to the Air Force life and the Cliffords were seasoned and worldly; they ran with the “older” crowd. Sandy was one of my first exposures to a Southern Belle. She was from Louisiana and had a deep accent that was exotic to my Yankee hearing. She played bridge, could throw a wicked bowling ball, had a hearty and infectious laugh, smoked cigarettes, and drank bourbon. I was in awe of her. Years later we found ourselves living in the same neighborhood in Abilene, TX. When we arrived in town she immediately took me under her wing and taught me all there was to know about the city. Before we knew it, a friendship was born. Our sons were constant companions, we were both active members of the spouses’ club, our families started celebrating holidays together, and many a summer day was spent at the base pool while our kids swam. In 1994, at age 41, Sandy died of breast cancer. By then I was living in DC. I didn’t attend her funeral. I chose, instead, to visit her while she was still living. 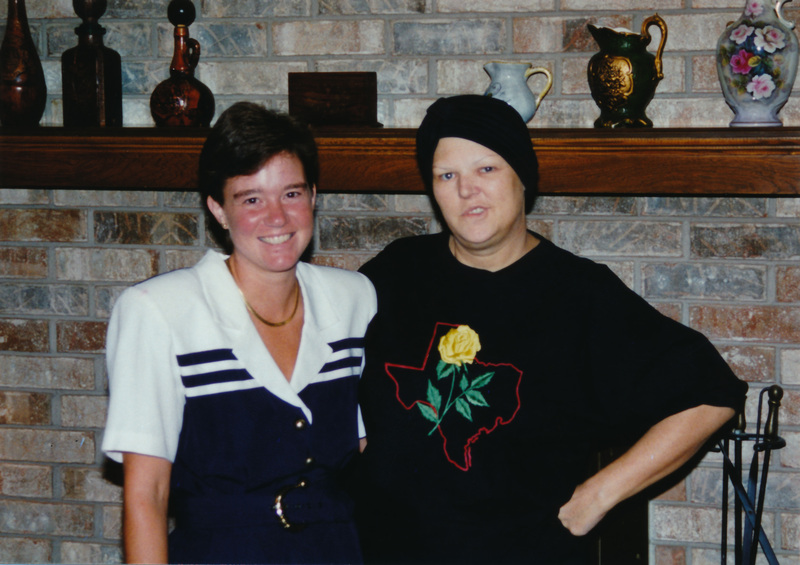 During that week I drove her to San Antonio for a chemo treatment. I still remember how much we laughed on that trip. She kept telling me to not worry about the speed limit, as she had the whole “cancer patient” persona down pat and no cop would dare ticket me once she took off her turban, exposed that gorgeous bald head, and started throwing up. It was so typical of her to take a reality that sucked and find the humor. For three and a half years I’ve lived in the town she’s buried in. I finally visited her grave this week. Sandy became a grandma for the first time on January 15th. I wanted to be with her. I wanted to physically commemorate her grandson’s entrance into this world. I left flowers on her grave. I did it for me and for her daughter, who lost a mother when she was just a preteen. For a daughter who would give anything to be able to see her mama hold her grandchild. And I took pictures because the word “beyond” has been on my mind all week. When I visit a cemetery I usually spend quite a lot of time thinking of what is beyond. I went back three days in a row, looking for the perfect light and time of day, which I never really found. But I did a lot of “beyond” thinking and a lot of wondering about all the families and the stories contained in this particular cemetery. You are still remembered and missed my friend. Someday those of us still walking around cemeteries will find out lies beyond. You already know. And yes, I can still hear your laugh. I now see why it took you a while to compose this. You are such a blessing to all and especially to me! Miss you! Sandy has been on my mind a lot lately as I just lost another friend to this awful disease after a long & valiant 6 years. I am so happy to hear that she has a grandchild. She would be loving it-as she did everything! Thank you for sharing the news, Julie, and your thoughts. Sandy was a great lady! Julie what beautiful words and pictures. As always thank you for sharing! Julie, Thanks for posting this beautiful memory of Sandy. I too remember her from Wurtsmith AFB but didn’t have the pleasure of getting to know her as you did. As my mother grows closer to her end of life, I am reminded that she did have 21 more years to spend with her two grandchildren, and the wonderful opportunity to know her great-granddaughter for the past 8 years. I love you Melinda. Keep fighting, you are an inspiration to so many of us. Sandy and I have been best friends since the sixth grade, we were always together! She spent many summers with me when I lived in Rayville. I remember when we were about thirteen, she ran away from home for a day to the same cemetery that she’s at now; she lived to streets over from the cemetery. Spent my days with her when she and Katie would come home from Michigan. Went to visit her lots of times when they moved to Weatherford then to Abilene. It seems like yesterday that she was with us. I miss her soooo much. She knows all my secrets!! lol I was with her two days before she went home to see JESUS. I couldn’t make my self go to the funeral, I didn’t want to face the fact that she was no longer here; I wouldn’t be able to hold her are talk to her,I was lost. Did any one ever know that she had never had a mammogram; I didn’t, I just assumed it was a part of her routine check up’s. She was so good about the others; Paps, dental, eyes, etc. If only I would have known….. Her family was her whole life; Sandy loved her husband and her children; it was all about them!!! Sandy’s sister Edith is Casey second mom now and she couldn’t have a more loving aunt than her aunt Edie!! Julie, Thank you sooo much for this posting, I think of Sandy almost everyday, I feel her around me. My brother is battling cancer. 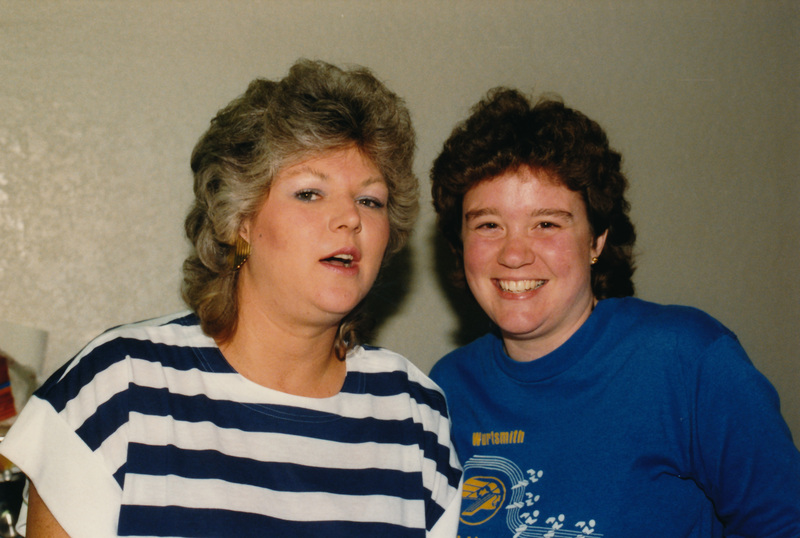 I HATE cancer………..
Gidget, I’m SO happy you commented on the blog and added your memories of Sandy. She was definitely one of a kind! She was taken from all of us way too early but she does, indeed, live on in all our hearts. And I’m so glad Kasey has her Aunt Edith. I have no doubt she loves Kasey as much as Sandy did and I’m comforted to know she’s a part of her life. So much has been learned about cancer and it’s treatment since Sandy died. I hope your brother benefits from that knowledge and calls himself a survivor for many years to come.